Another Halloween Season is over and its nearly that time of year again. The season of Christmas parties is just around the corner and if you have the responsibility of organising the companies Christmas party then we have your Christmas bunting & flags covered. We have a large selection of Bunting in stock for you to browse through. No Christmas party is complete without having some Christmas bunting & flags in place to enhance the Christmas spirit. 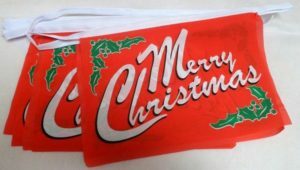 FlagMan.ie are one of Irelands biggest stockists of Christmas bunting & flags for sale. We ensure that our bunting & flags are priced to sell which means that you get very good value for money. All of our bunting & flags are of excellent quality and we are confident that you will be satisfied with your purchase. To make things better we offer FREE delivery on all of our bunting & flags right across the Republic of Ireland. We really can not be beaten on quality or price. You can browse our bunting & flags category by clicking on the link below. If you do not find what you are looking do not worry. Simply drop us a call on +353(0)857024810 / +353(0)857474480 or email info@flagman.ie and we will happily help you out. In addition, you can view our Christmas Bunting & Flags categories here. Flagman, Ballytarsna, Nurney, County Carlow.